Trigeminal autonomic cephalalgia (TAC) is a term that was coined by Goadsby and Lipton  in 1997, to reflect the common feature among a group of short-lasting primary headaches, that is, excessive cranial parasympathetic autonomic reflex activation to nociceptive input in the ophthalmic division of the trigeminal nerve. Trigeminal-autonomic activation is the hallmark of these syndromes, which we now commonly refer to as TACs. Subsequently, the term officially appeared in the International Classification of Headache Disorders version 2 (ICHD 2), given the research into these conditions and the unifying pathogenesis. It can be argued that such nosologic classification and reorganization of headache types has minimal impact on clinical practice and that it is purely for the research purposes. However, the ICHD should be viewed as a diagnostic aide-memoire for clinicians. This classification, based on the similarity of their pathogenesis, aids the clinician by narrowing the list of relevant differential diagnoses. TAC is an umbrella term that encompasses four primary headache disorders – cluster headache (CH), paroxysmal hemicrania (PH), hemicrania continua (HC), short-lasting unilateral neuralgiform headache attacks with conjunctival injection and tearing (SUNCT)/short-lasting unilateral neuralgiform headache attacks with cranial autonomic symptoms (SUNA). Cranial autonomic symptoms are cardinal features of TACs. These include conjunctival injection, lacrimation, nasal congestion, rhinorrhea, and aural fullness. The unifying clinical features for these syndromes are that they all present with unilateral pain in the distribution of the trigeminal nerve with associated cranial autonomic features ipsilateral to the pain. It should be in the forefront of the clinician's mind when presented with a patient with unilateral head pain and cranial autonomic symptoms in any clinic. HC was initially categorized under “other primary headaches” in ICHD-2. However, this has since been revised under the ICHD-3 version  and is now included under the category of the TACs, given the overlap in the activation of the posterior hypothalamic grey, and the shared clinical feature of indomethacin responsiveness. From functional neuroimaging studies, it has been shown that the hypothalamus is activated ipsilateral to the pain in CH,,,, contralateral in PH, ipsilateral  and bilateral  hypothalamic activation in SUNCT, and contralateral  in HC. There is further evidence to support the hypothalamic involvement from deep brain stimulation targeting the posterior hypothalamus in CH ,, and changes in melatonin ,, and orexin , in CH. SUNCT/SUNA is short, and typically a single attack lasts 1–10 min in duration and can occur multiple times a day, and the frequency tends to be in the hundreds. The quality of pain is typically described as stabs or jabs and has a predilection for the first division of the trigeminal nerve. There are three clinical types of SUNCT/SUNA; they can occur as individual and single stabs, a group of individual stabs, or as a “saw-tooth” pattern [Figure 1]. Each attack is associated with ipsilateral cranial autonomic symptoms. In SUNCT, there is conjunctival injection and tearing, whereas in SUNA, there may be cranial autonomic features other than conjunctival injection and lacrimation. This entity is often confused with trigeminal neuralgia, given the short duration of the attacks. There are several clinical features, which may assist in the differentiation between these disorders. SUNCT/SUNA mainly affects the first division of the trigeminal nerve, whereas trigeminal neuralgia typically involves the second and third divisions, rarely affecting the first division. Furthermore, it is important to assess if attacks are consistently triggered by cutaneous stimuli. The presence of a refractory period to these triggers  is a feature of trigeminal neuralgia, whereas its absence is more in keeping with SUNCT/SUNA. In general, trigeminal neuralgia should not have significant cranial autonomic features, and if this is present, one should consider SUNCT/SUNA. PH is a rare TAC characterized by unilateral attacks of pain lasting for 2–30 min and can recur up to forty times a day, with a mean of 11. The attacks are severe and mainly involve the periorbital and temporal area and are associated with cranial autonomic features and respond to indomethacin. Attacks are always unilateral; however, they can side-shift. Patients can have photophobia and phonophobia, and these tend to be lateralized to the side of the pain. The attacks do not typically occur at night as CH attacks do. The attacks of PH are mostly spontaneous; however, 10% can be triggered by bending or rotating the head. Alcohol can trigger attacks in one-fifth of patients, but this is less reliable as compared to its effect on triggering CH attacks. The attacks are not associated with cutaneous triggers. PH can be classified into episodic- or chronic-based on the time of remission. Episodic PH occurs in 35% of patients and is defined when there are remission periods lasting 3 months or longer, whereas in chronic PH there is either the absence of a remission period or remissions last <3 months, for at least 1 year. CHs affect up to 0.1% of the population, and is the most common of the TAC disorders. CH patients have attacks that can last from 15 min to 3 h, however, on average, they tend to last from 45 to 90 min  and can occur once every other day up to eight times a day, typically at certain times of the day with a circadian periodicity. The pain is unilateral and is concentrated in the peri-, retro-orbital, and temporal areas. In addition, there are prominent cranial autonomic features. This is one of the most painful conditions known to humans, and it has been described by patients to surpass the pain experienced from a fracture or during childbirth. During attacks patients have an intense sense of restlessness or agitation and some patients prefer to pace or fidget. Often patients apply pressure with the palm of their hands onto the epicenter of the pain, whether this is their eye or temple, to gain some pain relief. In addition to the circadian periodicity, CH attacks demonstrate a circannual periodicity where attacks “cluster” over particular periods of the year, typically occur around the change of seasons. The periods where patients experience attacks are called “bouts” and they may last for 6–12 weeks in duration. Depending on the time between attacks, CH can be further subclassified into episodic and chronic CH. Episodic CH is defined when there is a remission period between attacks for more than 3 months without any form of preventive treatment. Whereas, in chronic CH, there is either the absence of a remission period or remissions last <3 months for at least 1 year. During a bout, CH attacks may be triggered by alcohol,, food containing nitrates, nitroglycerin, and strong odors such as paint and nail varnishes. The differentiation of CH from PH can be challenging, especially as the attack duration can overlap in these conditions. 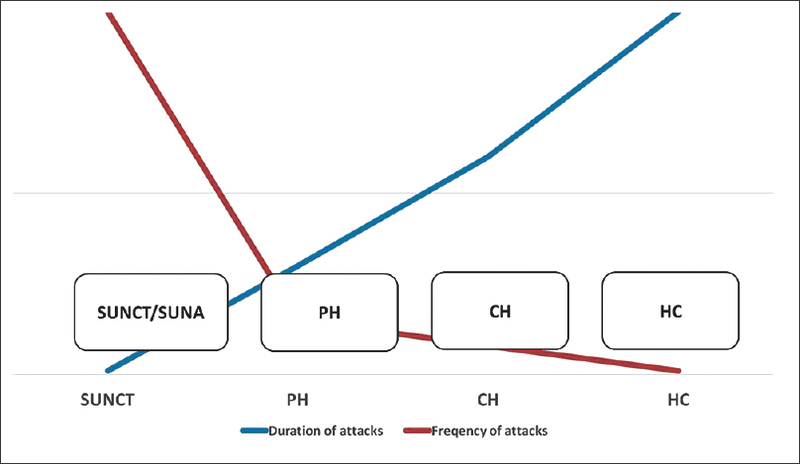 Shorter and frequent CH attacks may be confused as PH attacks. There are several clinical features that may help in distinguishing these disorders. The presence of agitation during attacks and alcohol triggering attacks within a bout is consistent with CH. Anecdotally, some PH patients have found that taking higher than recommended doses of nonsteroidal anti-inflammatory drugs (NSAIDs), for example, ibuprofen, have been useful in their attacks. Patients, who have found high flow oxygen delivered through a nonrebreather mask useful in aborting their attacks within 15 min, are more likely to be suffering from CH. Although these features can help distinguish between the two TACs, ultimately for a definitive diagnosis of PH, the patient should respond to an adequate dose of indomethacin. HC is characterized by a continuous unilateral headache that waxes and wanes in its intensity without complete resolution. Like PH, it has an indomethacin response. Diagnostic uncertainty between HC and chronic migraine can occasionally arise when a patient presents with a lateralized headache with associated cranial autonomic features. This dilemma can be overcome by assessing the responsiveness to indomethacin. In HC, there is a continuous baseline pain with intermittent worsening. This clinical picture can be confused with the interparoxysmal pain that may be associated with the other TACs, such as in SUNCT/SUNA, PH, and interparoxysmal allodynia in CH. This appears to be linked to the coexistence of TAC biology with migraine, and patients can have concomitant migraine or a family history of migraine. It is important to recognize this clinically, especially when the interparoxysmal pain becomes troublesome as TAC patients with a migrainous biology can be susceptible to medication overuse  and should be treated accordingly. In particular, the duration and frequency of the attacks can elude to the diagnosis; however, it is important to remember there is considerable overlap. 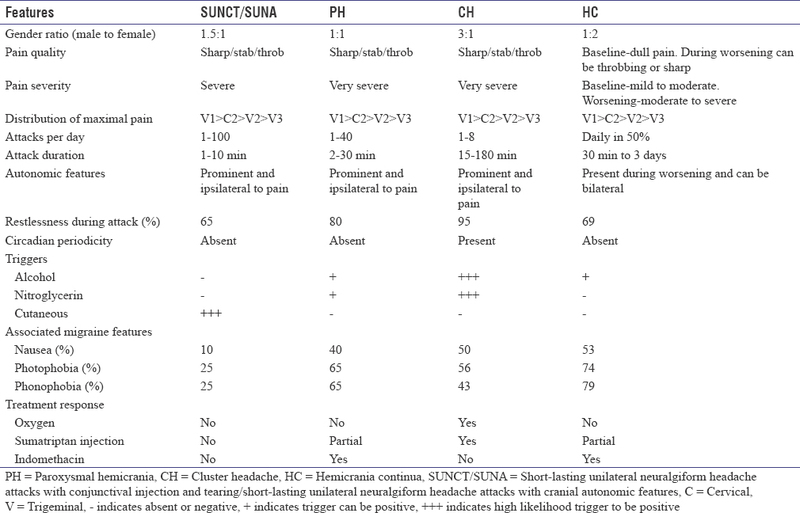 In general, SUNCT/SUNA has the shortest attack duration and the highest frequency of attacks over 24 h. This is followed by PH and CH, with HC having a continuous pain superimposed with worsening [Figure 2]. One key clinical feature that distinguishes TACs from other headaches is the lateralization of associated symptoms and cranial autonomic symptoms. Although patients with unilateral migraine experience unilateral photophobia or phonophobia ipsilateral to the pain, this occurs only in <5% of patients, whereas lateralized photophobia and phonophobia are present in more than 50% of TAC patients. In addition, the lateralized cranial autonomic symptoms are less prominent in migraine as compared to TACs. Migraineurs may experience cranial autonomic features; however, this is typically bilateral, whereas in TACs, it is generally unilateral and ipsilateral to the side of the pain. Although it is logistically easier to perform an oral indomethacin trial, such as commencing with 25 mg three times a day and gradually escalating the dosage up to 75 mg three times a day over a course of 3 weeks in the outpatient setting, there are several confounding factors that may affect the outcome of this test. These include medication compliance, pharmacodynamics, and pharmacokinetic considerations. From existing literature on oral Indomethacin tests, it has been reported that some patients needed more than 1 trial, and in one case the patient had more than 30 trials, before obtaining a positive response. Antonaci et al. proposed the standardized “Indotest,” using intramuscular indomethacin and a headache diary. It is expected to have a protective refractory period of 13 ± 8 h following 50 mg indomethacin injection and 13 ± 10 following 100 mg, with this protective effect starting between 22 and 73 min after the injection. It is essential to have an accurate headache diary prior the test, firstly to time the injection to the most likely expected time for an attack and to compare the number and severity of attacks pre- and post-test. To enhance the accuracy, we recommend a blinded placebo-controlled intramuscular indomethacin test with 100–200 mg, with intramuscular normal saline as the placebo. The headache diary is compared between the days placebo, and indomethacin were given  to come to an accurate diagnosis. We recommend that all new presentations of TACs be thoroughly investigated with a MRI head with gadolinium to exclude any pituitary pathology. In addition, pituitary function testing should be pursued, as there is a known association for pituitary and peripituitary gland disease to be present with TACs. In a cohort of 84 patients with pituitary tumors and headache problems, 10% had a TAC-like headache, this is approximately a 100-fold increase compared to the normal population. Furthermore, it is important to keep in mind the secondary causes of TACs as outlined in [Table 2]. After the exclusion of secondary etiology, in cases with TAC symptomatology not fulfilling diagnostic criteria, it would be reasonable to classify as “probable TAC” as set out in ICHD-3, whereas assessing the response to specific treatments such as high flow oxygen and indomethacin. It is necessary to follow-up these patients longitudinally as features may become more distinct over time. Since the introduction of the TAC nosologic entities in 1997, we have had several advances in our understanding of SUNCT/SUNA, PH, CH, and HC. 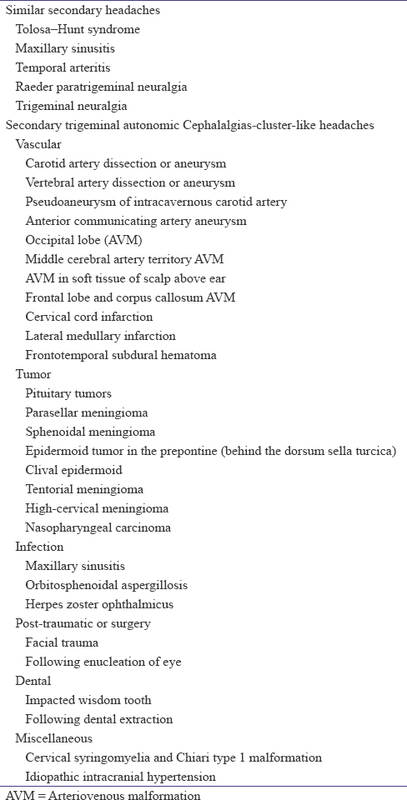 These disorders share common clinical features, which are characterized by unilateral cephalic pain affecting the trigeminal distribution associated with lateralized cranial autonomic features. This is further unified by experimental and functional neuroimaging studies implicating the hypothalamus and the trigeminal-autonomic reflex. The understanding and recognition of these primary headaches are crucial in clinical care as their management is so vastly distinct. P.J. Goadsby reports personal fees from Allergan, Amgen, and Eli-Lilly and Company; and personal fees from Akita Biomedical, Alder Biopharmaceuticals, Cipla Ltd, Dr. Reddy's Laboratories, eNeura, Electrocore LLC, Novartis, Pfizer Inc, Quest Diagnostics, Scion, Teva Pharmaceuticals, Trigemina Inc., Scion; and personal fees from MedicoLegal work, Journal Watch, Up-to-Date, Massachusetts Medical Society, Oxford University Press; and in addition, Dr. Goadsby has a patent Magnetic stimulation for headache assigned, without fee, to eNeura. Headache Classification Committee of the International Headache Society (IHS). The International Classification of Headache Disorders, 3rd edition. Cephalalgia. 2018;38:1-211. Goadsby PJ, Lambert GA, Lance JW. Effects of locus coeruleus stimulation on carotid vascular resistance in the cat. Brain Res 1983;278:175-83. Goadsby PJ, Lambert GA, Lance JW. The peripheral pathway for extracranial vasodilatation in the cat. J Auton Nerv Syst 1984;10:145-55. Akerman S, Holland PR, Summ O, Lasalandra MP, Goadsby PJ. A translational in vivo model of trigeminal autonomic cephalalgias: Therapeutic characterization. Brain 2012;135:3664-75. Sprenger T, Valet M, Platzer S, Pfaffenrath V, Steude U, Tolle TR, et al. SUNCT: Bilateral hypothalamic activation during headache attacks and resolving of symptoms after trigeminal decompression. Pain 2005;113:422-6. Matharu MS, Goadsby PJ. Functional brain imaging in hemicrania continua: Implications for nosology and pathophysiology. Curr Pain Headache Rep 2005;9:281-8. Bruera O, Sances G, Leston J, Levin G, Cristina S, Medina C, et al. Plasma melatonin pattern in chronic and episodic headaches: Evaluation during sleep and waking. Funct Neurol 2008;23:77-81. Holland P, Goadsby PJ. The hypothalamic orexinergic system: Pain and primary headaches. Headache 2007;47:951-62. Maarbjerg S, Gozalov A, Olesen J, Bendtsen L. Trigeminal neuralgia – A prospective systematic study of clinical characteristics in 158 patients. Headache 2014;54:1574-82. Irimia P, Cittadini E, Paemeleire K, Cohen AS, Goadsby PJ. Unilateral photophobia or phonophobia in migraine compared with trigeminal autonomic cephalalgias. Cephalalgia 2008;28:626-30. Schürks M, Kurth T, de Jesus J, Jonjic M, Rosskopf D, Diener HC, et al. Cluster headache: Clinical presentation, lifestyle features, and medical treatment. Headache 2006;46:1246-54. Cittadini E, Goadsby PJ. Hemicrania continua: A clinical study of 39 patients with diagnostic implications. Brain 2010;133:1973-86. Ashkenazi A, Young WB. Dynamic mechanical (brush) allodynia in cluster headache. Headache 2004;44:1010-2. Goadsby PJ, Cittadini E, Burns B, Cohen AS. Trigeminal autonomic cephalalgias: Diagnostic and therapeutic developments. Curr Opin Neurol 2008;21:323-30. Lai TH, Fuh JL, Wang SJ. Cranial autonomic symptoms in migraine: Characteristics and comparison with cluster headache. J Neurol Neurosurg Psychiatry 2009;80:1116-9. Pareja J, Sjaastad O. Chronic paroxysmal hemicrania and hemicrania continua. Interval between indomethacin administration and response. Headache 1996;36:20-3. Antonaci F, Pareja JA, Caminero AB, Sjaastad O. Chronic paroxysmal hemicrania and hemicrania continua. Parenteral indomethacin: The 'indotest'. Headache 1998;38:122-8. Türkoǧlu G, Türkoǧlu S, Kayal S, Karahan AY. Indomethacin-induced psychotic disorder. Clin Neuropharmacol 2016;39:161. Tharumaratnam D, Bashford S, Khan SA. Indomethacin induced psychosis. Postgrad Med J 2000;76:736-7. Singh RP, Sinha AK. Organic psychosis with indomethacin. J Indian Med Assoc 1978;71:210. Nassif JM, Ritter MA. Indomethacin-induced postoperative psychosis. J Arthroplasty 1999;14:769-70. Gotz V. Paranoid psychosis with indomethacin. Br Med J 1978;1:49. Carney MW. Paranoid psychosis with indomethacin. Br Med J 1977;2:994-5. Bessa O Jr. Acute psychosis due to indomethacin. Conn Med 1994;58:395-6. Levy MJ, Matharu MS, Meeran K, Powell M, Goadsby PJ. The clinical characteristics of headache in patients with pituitary tumours. Brain 2005;128:1921-30. Goadsby PJ. Trigeminal autonomic cephalalgias. Continuum Lifelong Lerarn Neurol 2012;18:883-95.